NCsoft's new president of publishing, David Reid, hopes to dispel rumors (no, Tabula Rasa isn't shutting down) and clear the air about the company's recent restructuring. 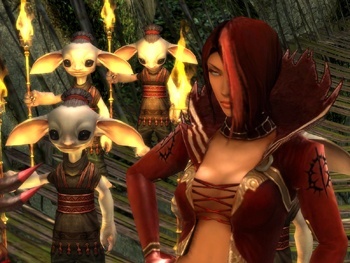 In a recent phone interview with The Escapist, Reid echoed statements that he had made earlier indicating that the changes to NCsoft were meant to streamline the publishing process. Although some of the restructuring is philosophical, with the company now focusing more intently on "AAA list" titles like Guild Wars and Lineage II, some of the motivation for the decision to move the publishing headquarters from Austin to Seattle was strictly practical. "On the basic level, it is very difficult, and in fact now impossible, to get a nonstop flight from Austin to Seattle," explained Reid. "But a second part of it is just, you know, if you're going to be great in the publishing business, you need be around the other great publishers." Reid also stressed that although NCsoft will be throwing its weight behind larger games like City of Heroes, smaller titles such as the free-to-play Dungeon Runners are not being shut down. That said, it's unlikely that those titles will receive the same sort of support and attention that they have previously. "If you're the type of person who bets on things, the safer things to bet on is that future expansions would be coming out for games like Guild Wars or Lineage," said Reid. "Not that these lighter games have gone badly for us, but if you go all-in on some of these bigger things, the reward is greater for the company." NCsoft had previously announced an exclusive partnership with Sony to bring MMOGs to the PS3, and though the company is still interested in tapping the non-PC market, Reid says the company is keeping its options open. "We have a good relationship with Sony and we're excited about it, but there are a lot of good platforms out there," he said.